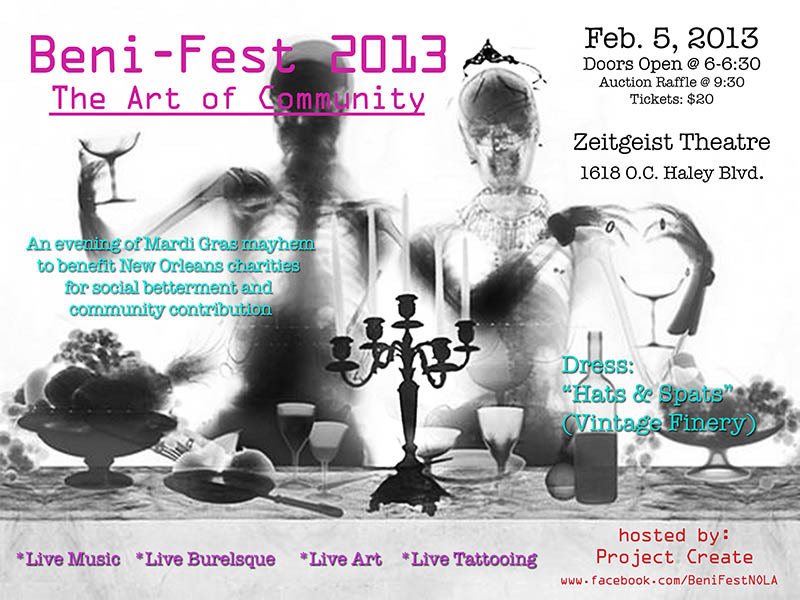 Project Create is about to have the awesome opportunity of being part of an upcoming festival on February 5th! Come and join us for An Evening of Mardi Gras Mayhem to Benefit New Orleans Charities & Non-Profits. Come enjoy a true New Orleans experience. Get body painted, dance to great music, add a few tattoos to your collection, see inspiring art work, be immortalized in a painting by Alex Harvie, and much more!!! Southern Animal Foundation, Project Create, Hope Stone, Youth Empowerment Project, Cheer-Up Missions, St. Jude Community Center, Community Works of Louisiana, and others. P.S. this whole event was put together by an amazing dude I have the pleasure of calling my colleague. I know he wouldn’t want to steal any spotlight, but you know who you are! Join SoFAB and Project Create to craft some timely last minute gifts or place-settings for your friends, family, or even yourself! This simple activity allows you to create unique napkins and napkin rings that make your table stand out through the holidays. It’s easy enough for the kids to do but fun for crafty adults too! Project Create is an upstart art nonprofit dedicated to encouraging all members of the community to participate in and create art. They are New Orleans’ first art studio where everyone can be an artist and create art without limitations. They provide the supplies, instruction, and studio space for YOU to create art. 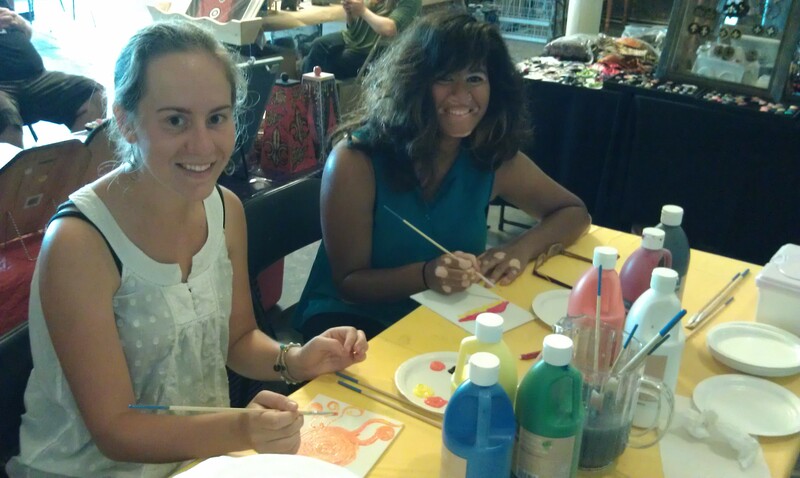 On December 8, from 11:00 am to 1:00 pm, Project Create is hosting its first painting class!!! I could not be more excited. What a great (and cheap) gift idea for a loved one! The class will take place during the December OCH Holiday Arts Market, so make sure to check out the great vendors before and after the class. To sign up, please email jordanfrankel@projectcreatenola.org. Project Create is pumped to invited back to the Arts Council of New Orleans Arts Market this month. We will be there for the 2 day market providing another FREE Kids Activity Booth. Here is the info for the event, and check out our write up on the Arts Council website! Palmer Park, S. Carrollton and S. Claiborne Aves in Uptown. A few weeks ago, Project Create had the great honor and pleasure of providing an art project at the Louisiana 22q/VCFS Support Network Fall Picnic. The 22q11.2 deletion syndrome is caused by a missing section (microdeletion) of chromosome 22 which is present from the time a child is conceived. Present in 1 out of every 2,000-4,000 live births, in 1 in 68 children with congenital heart disease, and in 5 to 8 percent of children born with cleft palate, the 22q11.2 deletion is almost as common as Down syndrome, a widely recognized chromosomal disorder. The symptoms of 22q vary widely, but there is one thing every child with 22q has in common: dreams of a bright future! So Project Create and the Louisiana 22q/VCFS Support Network teamed up to bring a group art project to the annual picnic. The project was a great success and everyone had a great time making their birds. 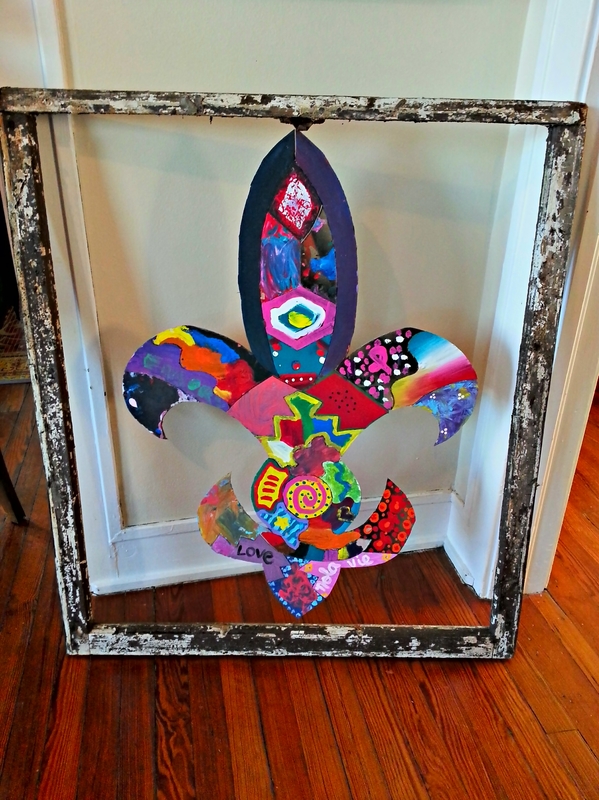 If you are interested in having Project Create provide an art project like this for a private event, please contact Jordan at jordanfrankel@projectcreatenola.org. Also, stay tuned for a tutorial on how to recreate this project and please donate so that we can open our studio!!! 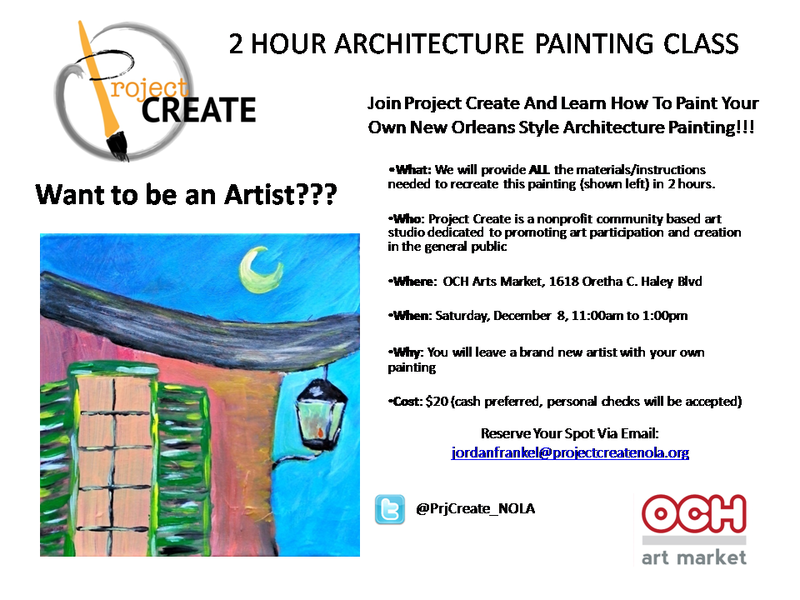 December 8 – Be A Student In Our First Painting Class: New Orleans Style Architecture!!! October Arts Council Art Market – Big Numbers for a Big Day!!! First, this marks the 40th blog post for Project Create!!! I know 40 seems like an odd number to celebrate, but I am in a celebratory mood and our 40th post is 40 more than zero, which is where we would be if Project Create didn’t exist. Secondly (and probably more importantly), I want to fill you all in on the great day we had on Saturday at the Arts Council Of New Orleans Arts Market. It was a cold and blustery New Orleans afternoon (I think maybe around 60 degrees), which is certainly not what I had anticipated the hot south to be like, but I am not complaining! Nevertheless, the New Orleans community braved the chill and the market was jam packed. Project Create’s Children’s Painting Booth produced 62 paintings. Sixty Two!!! This. Is. Incredible. In one day, because of Project Create, there are 62 more artwork in the world. This brings our total up to 108 new artists! A few weeks ago, Project Create had the amazing opportunity to provide and participate in a community art project at the Faubourg Delassize neighborhood’s Night Out Against Crime. The event was put on by Jericho Road, a New Orleans housing initiative that helps provide affordable and energy-efficient housing opportunities. I was contacted by one of Jericho Road’s community developers, Caitlyn, who was actually one of Project Create’s first painters at the OCH Art Market in September (check out her painting here)! She had remembered our company and reached out to me to provide art entertainment at the event. Talk about AWESOME!!! The Night Out Against Crime was part of the nationwide effort to promote crime prevention and awareness. What a great event for PC to be a part of! 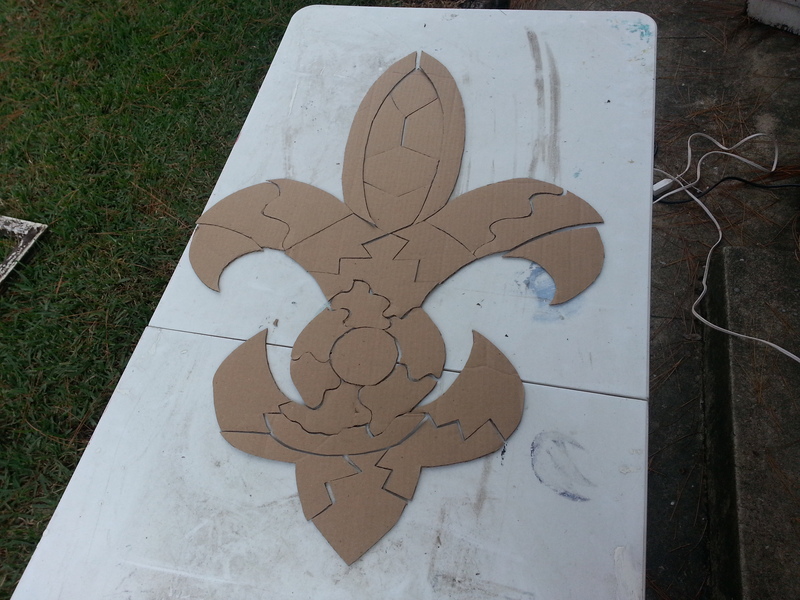 The Faubourg Delassize is a very close knit community in the Central City area of New Orleans, and there was an overwhelming level of participation and acceptance of Project Create’s group art project. We created a Wish Board using the Delassize community symbol. I had pre-cut the symbol out of reclaimed wood, and all of the materials cost less than $20 total. With over 30 participants, the group artwork was made for less than 75 cents per person!!! The Wish Board represents the hopes and dreams of the community, with each participant writing down their dreams on a ribbon (we used surveyors flagging tape, so it would withstand the elements). We then tied the ribbons onto the board (attaching them to screws that were screwed around the border of the symbol). The ribbons were weaved in and out of each other and around the screw border, creating a fabric of dreams and wishes for the community. We installed the piece at the corner of Saratoge and Seventh Streets, on the fence surrounding the city owned, abandoned lot. That location was chosen to represent the community’s desire and ability to beautify their own neighborhood with their own hands. Here are the pictures from the night! It is for events like these that Project Create exists. People being creative just for fun. We had a great time that night, and look forward to participating in similar events. If you know have anything you would like Project Create to provide art entertainment for (including birthday parties! ), please reach out to Jordan Frankel at jordanfrankel@projectcreatenola.org. Also, to keep free events like the Night Out Against Crime happening, please DONATE to Project Create!!! Well I can say with no small amount of pride that Project Create has made it big!!! We are now working in association with the Arts Council of New Orleans to provide an activity booth for kids at the Arts Market this weekend…as in the Arts Council actually contacted Project Create and hired us (enter screams and shouts of glee and merriment)!!!!!!!!! So come on down tomorrow (10/27) to Palmer Park (on the corner of Carrollton and Claiborne). We will be there from 10 till 3:30 with painting activities for your kids! And don’t worry, parents and adults can paint too (if you ask nicely…).